These inkjet / laser DVD case inserts fit the 14mm size DVD cases and have micro perforations for easy tear down to 10 3/4" x 7 3/16" which is a custom fit for standard DVD cases. These DVD case inserts are good quality 32 lb matte bright white paper stock. Great for full bleed DVD storage case graphic cover designs. These Professional Label brand sheets are compatible with the following software programs: Memorex ® software exPressit tm as well as many other popular labeling programs. Or, just download the free software and template below. 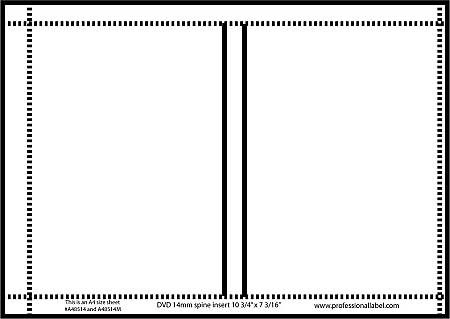 Compare these Professional Label brand DVD case inserts to Memorex® DVD case inserts.